As B2B marketers, we’ve all grown used to the idea that people’s experiences as consumers can shape the way they think and choose as B2B buyers. We know, for example, that relevance is increasingly important for B2B content marketing because the audiences you are targeting are also customers of the likes of Amazon and Netflix. They take it as a given that the content and recommendations they encounter as consumers will be personalised to them – and that’s what they increasingly expect in their professional lives as well. However, personalised services and tailored content aren’t the only aspects of life as a consumer that can carry over into life as a B2B buyer, influencer or decision-maker. For years, B2B marketers were guilty of assuming that their audiences switched their brains into ‘rational thinking only’ mode whenever they walked through the door of the office, or sat down with a laptop. We know today that isn’t the case, but I still think we could do more to explore the different factors that sway buyers’ choices, often without them realising it. That’s why I paid particular attention to this Infographic that I found on Neil Patel’s blog recently (it’s a great blog by the way, one of our 50 recommendations for B2B marketers). 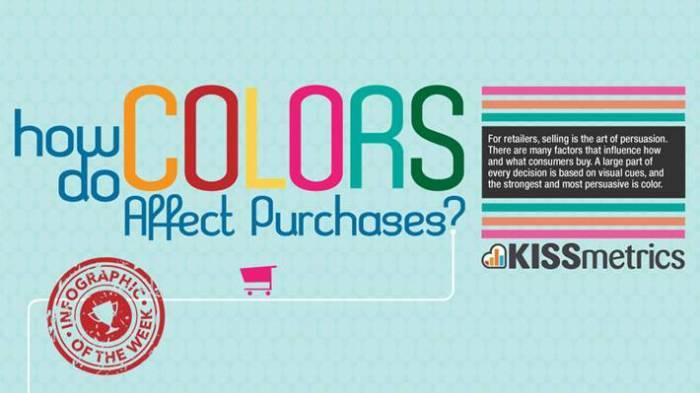 The Infographic was produced by Kissmetrics (another great blog to follow) and leverages research into the impact of colour in consumer and retail marketing. It’s a great reminder of just what an influence colour choice can have on how a brand and its products are perceived – and I believe that applies just as much to B2B brands as to B2C ones. Different cultures have different colour cues (the data in this infographic relates to North America and there’s some cross over to the UK and Western Europe, but it’s definitely worth researching the nuances of colour in your market). Colour has an obvious role in your brand identity, logo and owned properties like your website and blog – but the powerful influence that it has means you should also try experimenting with it in content. A/B test different colours in infographics, illustrations and images and see how they resonate with different audiences. Could you be making more use of colour in your B2B branding and content marketing strategy? Scroll down, explore the infographic and see what you think. Read the original article on business.linkedin.com.